We have several really nice recipes for you this week. The first, Jeanell Rogers’ Perfect Roast Beef, is from Treasures and Pleasures cookbook, published many years ago by the Presbyterian Women of First Presbyterian Church of Apopka. This publication is a favorite of many Apopka ladies, including me! Rachel Pfaender’s Cuban Chicken is from First Presbyterian Church of Punta Gorda in their own A Taste of Heaven. This is a one-dish meal. From Southern Living’s All-Time Favorites, their Creamy Macaroni and Cheese looks like cheese heaven. Apopka Historical Society’s Preserving the Big Potato, shares Swiss Potato Soup. They use mashed potato flakes, but you could certainly use freshly cooked potatoes if you like. George LaPierre’s Party Beefy Cheese Dip comes to us from New Vision Community Church’s Feeding the Flock. It looks simple and quick. George says to serve it with Tostitos corn chips. Ummmm, good! Brenda Hubble’s Bow Tie Pasta Salad also looks simple and delicious. This is a Northside Baptist Church recipe. Dill Pickles from Beth Walters in Food Favorites of Plains, Georgia, Plains Pot Pourri is a recipe that is a little spicy, but not too much. Just enough to help you stay awake. Mrs. Myrt Hubbard, a dear friend who passed a few years ago, shares her Delta Chocolate Squares in The Apopka Woman’s Club What’s Cookin’? If the roast chosen is good, well marbled with fat, and is from one of the choice cuts, the less you do to it, the better it will taste. Allow the meat to arrive at room temperature. Wipe and rub well with salt and pepper. Place the roast fat side up in an open pan without water. If roast needs fat, fasten extra suet over top with string or skewers. Place the meat in hot oven 500 degrees for 20 minutes to sear. Do NOT open oven door. Reduce heat to 300 degrees and roast for 16 minutes per pound for rare beef or 22 minutes per pound for well-done beef. Should you use a meat thermometer, it will read 180 degrees for a well-done roast. Wash rice; heat salad oil and pepper in large fry pan; add onion, garlic and rice. Cook over low heat until yellow. Add stock, salt and paprika. Cook tightly over low heat until rice is cooked. Add chicken, ham and olives. Heat thoroughly and place in center of large platter. Surround with cooked asparagus tips and peas and garnish with strips of pimento. Melt butter in a large skillet over medium-high heat. Gradually whisk in flour until smooth. Cook, whisking constantly, two minutes. Stir in salt and next three ingredients. Gradually whisk in half-and-half and milk. Cook, whisking constantly, eight to 10 minutes or until thickened. Stir in extra-sharp cheese and half of sharp cheese until smooth. Remove from heat. Combine pasta and cheese mixture, and pour into six lightly greased (6-ounce) ramekins or 1 (8-inch square) baking dish. Sprinkle evenly with remaining sharp Cheddar cheese. Bake at 375 degrees for 20 minutes. (Bake 15 minutes longer for a crusty top.) Makes six servings. Note: For testing purposes only, we used Kraft Cracker Barrel cheese. In a medium saucepan, melt butter. Add onion and carrot. Cook, stirring occasionally until tender, about 5 minutes. Stir in milk, broth, salt and pepper; bring to a boil. Stir in potato flakes; cook until slightly thickened about 1 minute. Add Swiss cheese. Stir mixture until cheese melts. Yield: 4 servings. Brown ground beef with taco seasoning and water until water has evaporated. Drain grease. In 2-quart microwavable dish, mix meat with cheese and beans; microwave on medium high for 3 to 5 minutes. Stir and serve with Tostitos corn chips. Cool pasta, then mix all together and chill. Serves 12. 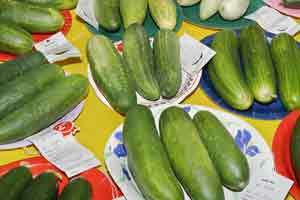 Wash and pack cucumbers (cut as desired) in sterilized jars. Pour liquid over cucumbers filling the jars and sealing. There is approximately 6 quarts of liquid. Recipe from The Apopka Woman’s Club, What’s Cookin’? Stir sugar into beaten eggs. Add flour, salt, vanilla. Add chocolate and butter that have been melted together; then stir in nuts. Pour into greased oblong 2-quart pan. Bake in 350 degree-oven for 30 minutes or until done. For softer surface, cover pan during half of baking time. Cut into squares to serve.